My son celebrated his 7th birthday last month, but because of our trip to Disney, we just had his birthday party this weekend. He really loves Science, so he requested a Science party this year. This was also the first year he had a party with just friends from school, so he was extra excited. After mailing the invitations I started work right away on the cake, decorations, ﻿and party details. For the cake, I ended up doing a two tier cake, covered in fondant and with lots of science details. The colors were vibrant and the details turned out well. 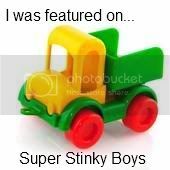 Best of all, my son loved it! For the decorations, we used a lot of my son's science things. We filled some flasks with radioactive rods (aka glow sticks) and candy to match our cake colors (green, orange and blue). We also filled his plastic test tubes with candy Nerds - they looked like some mysterious potions bubbling up. We added his shark in a jar, shark teeth, and some of his favorite rocks from his rock collection to our display as well. And, we made this banner reading, "Kaden's Lab,"﻿ with paper plates linked together with pipe cleaners. Each kid scientist who attended would receive their own clipboard with investigation sheets, a pair of goggles and a scientist badge.﻿ I purchased the mini clipboards from Target for $1 each in the Dollar Bins and the plastic badge covers (10 pack) at the Dollar Store for $1. We started our science party with a free exploration using magnets. I filled a large container with some sand from our sand box and filled it with different metal items. The kid scientists used magnets to find the hidden items and drew pictures of them on their investigation sheets. Our second investigation was called Drops on a Penny.﻿ The kid scientists made predictions about how many drops of water would fit on a penny, nickel, dime and quarter, then used pipettes to test their predictions and record their results on their investigation sheets. The fifth investigation was creating constellations, using dark colored paper and star stickers. We talked about what a constellation was and the kid scientists used their star stickers to create their own picture in the sky and used a piece of chalk to connect-the-stars to show their design. I didn't catch a picture of this one. The Milk Lab was our last investigation.﻿ In a shallow dish, I poured some whole milk, then put drops of food coloring in a circle in the center of the dish. I dipped a toothpick in some dish soap (we used Dawn) and placed it in the milk in the center of that circle of food coloring. The reaction is really cool! I purposely did not take a picture of the reaction, so you could be just as surprised when you try it yourself. The kid scientists drew pictures on their investigation sheet to show what happened. We also had rainbow spectrum fruit strips (aka fruit roll ups), marshmallow molecules, ﻿cheddar explosion goldfish, and pretzel pinwheel atoms. And of course there was every scientist's favorite fuel food - pizza! All in all, I think the party turned out great! The kid scientists seemed to have a lot of fun; even my son's teacher said that some of the kids wrote about the party in their journals Monday morning.﻿ As a former teacher, I had fun too, getting back into teacher mode for a bit. 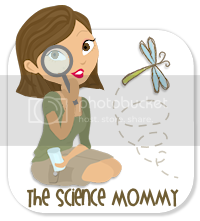 I don't believe I can share a link for my documents, but if you are interested in having a copy of any of the science investigation sheets or the kid scientist badges, just shoot me an email at themuddyprincess@gmail.com and I will email you the files. I love it!! Everything looks awesome. Kaden is one lucky kid. Awesome job! You are so talented. What a great party theme. I love it a lot. Everything looks great and well prepared. Job well done. Thanks for sharingI am your new follower. You can visit me at http://showmemama.com. Make sure you leave a comment so I know you visited. This is the most original party theme I have ever seen! As a former science teacher...you just made me beam. You'll be featured next week at Creative Juice Thursday. Thanks for sharing this with my readers! Awesome party! Love all the scientific investigations and the cake was fabulous! This is great! I love the treats in the flasks. So fun. And the handprint entrance poster is amazing. Thanks so much for sharing. This is truly amazing... Well done!! Those are some awesome ideas.. Hope the little bday boy and all the kids had a gorgeous time.... a party they will always remember!! Thanks so much everyone! Glad to see some new followers too! Nicolette, thanks for featuring my party next week! Kim, I'll check out your party themed link as well! This is too cool. Thanks for the great idea. My kiddos aren't in school yet so I will have to put this in the old memory bank for later. This is one of the coolest birthday parties if seen! Love it! I liked this so much I just created a link to it from my facebook page. Too cute! What a cute idea! How creative of you to think up all those little games! This is such a great idea. It really sounds like they had a blast. great cake. what a fun party. I love the hand scanner. This party & cake are so amazing! Love that the kids were having fun & learning something at the same time! Thanks so much for linking this up! WOW!! What an AWESOME party!! Amazing details! Love everything! The cake, the scan print and the tablescape! I am having a gibeaway on my blog. $38 + free ship from busy little hands to buy a cute kid backpack from her store. She has tote's for mom too. All you have to do is leave a comment.Do check it out. What a wonderful party. I will remember this idea for the future. I am over the moon about this party - such great ideas. I love it...in fact I am tickled pink. Going to use some of your ideas for my sons' upcoming science party! THANKS!!! Hi! I'm Kimberly, a SAHM, former early childhood educator, wife, friend, volunteer, and crafter. My two kids are creative, imaginative and funny, keeping me busy, but smiling. My husband of 13 years, is my best friend and biggest supporter, especially when it comes to all of my crafty antics. I have tons of fun ideas for playing, crafting and learning, but also get inspiration from other crafty moms and some totally awesome craft blogs. I hope some of my crafts will be an inspiration to you too! I'm also a Nature Rocks Ambassador. Getting our kids outside and exploring nature is a priority and can be lots of fun. You can find out more by clicking the NR button below. Email me any time at themuddyprincess@gmail.com ! Blogs I've Been Featured On!